Learn how to create your own hypertufa. Hypertufa troughs were developed in England as an alternative to old stone sinks which were used to feed and water livestock. They provide excellent drainage and can highlight those special small plants that you have! A planted trough can liven up a garden. 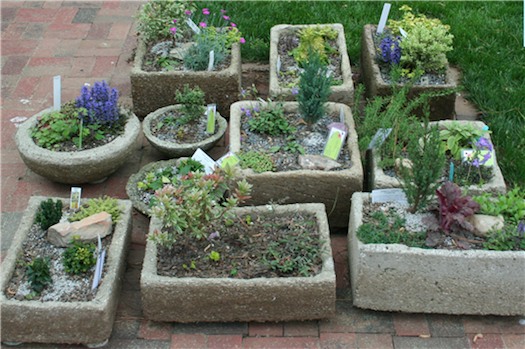 Create a one-of-a-kind hypertufa (pronounced hyper-toofa) planter with Laura Demme as your instructor. These hand-made planters look like rock and can be cast into almost any shape you want. Light weight and attractive, they will be the talk of your garden! Participants will learn how to mix the ingredients, a mixture of sand, peat and cement, build a container, and how to release a finished container from its mold. Dress for messy fun! Participants will make 1 medium-sized pot. Pre-registration is required. $25 for members and $35 for nonmembers. Participants will receive a coupon for 10% off at the store. Registration is limited to 10 people and is considered complete when payment is received. A supply list will be sent upon receipt. Registration is closed, to be added to the wait list or have questions, emai:l Laura Axel at [email protected] .